Experience the aerial beauty of downtown Baltimore as your journey through the skies. When you book, select a duration between either a 12-15 minute up to a 30-35 minutes and provide your desired departure time. This tour includes a pilot and can accommodate both small and large groups. Begin this tour at Pier 7 in Canton and meet your pilot at your selected time between 10am and 8pm. 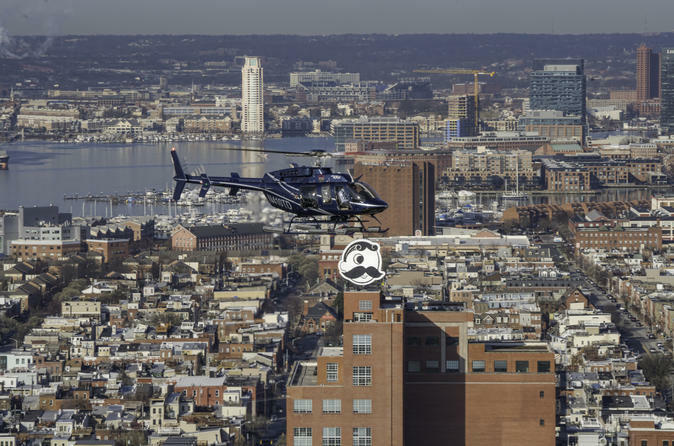 Board your helicopter and enjoy the aerial views of the Inner Harbor, Historic Fells Point, Oriole Park at Camden Yards and Ravens Stadium, Johns Hopkins Hospital, Mount Vernon, the Domino Sugar factory, Natty Boh Tower, Patterson Park, the USS Constellation and USS Torsk, the Chesapeake Bay, and more. Over the Northwest Harbor, enjoy a view of Fort McHenry from a bird’s eye view, the original location of the Star Spangled Banner. Depending on the option selected, your flight will last between 12 to 30 minutes before returning to Pier 7. Our package will certainly impress as you start your evening with a helicopter and finish it off with an amazing pre-set dinner at either Fogo De Chao or Phillips Seafood, with wine OR upgrade with dinner at La Cuchara where Chef-Owner will greet and and serve you a 6 course meal with wine-pairings! Keepsake glasses included! Pilot narrates the entire tour and is trained by local historians over our tour routes!